After our bad day in the Badlands, we were excited to be back on the road. 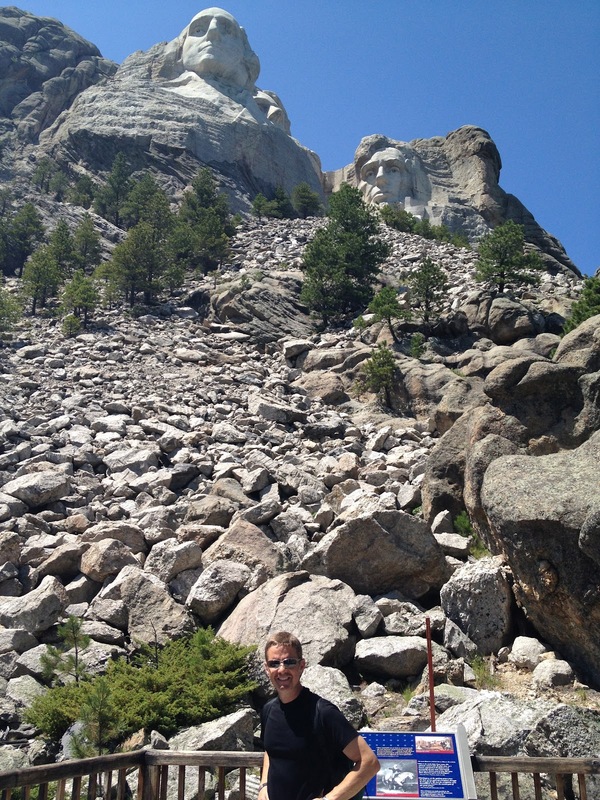 Next on the agenda was an American icon, Mt. 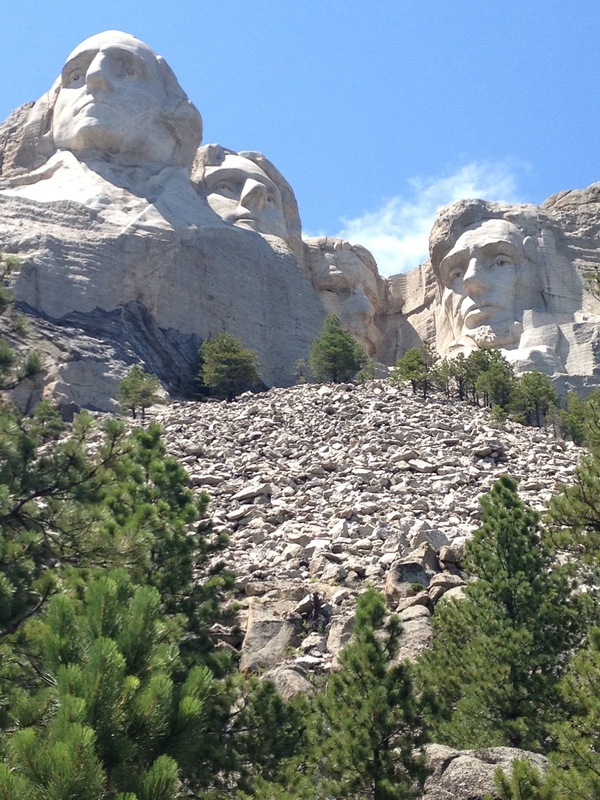 Rushmore. It was a super hot day, which I did not expect in South Dakota, so we lathered up with sun screen and joined the hoards of other people waiting to see what we had all seen in our school books growing up. At Mt. Rushmore you can view the Presidents, but they also have a gift shop, restaurant, amphitheater, museum, trail and artist’s studio. Some of these places are less crowded than others. Naturally, the food area and place to buy stuff is packed! The museum is a little less crowded and the trail was THE place to escape the crowds. 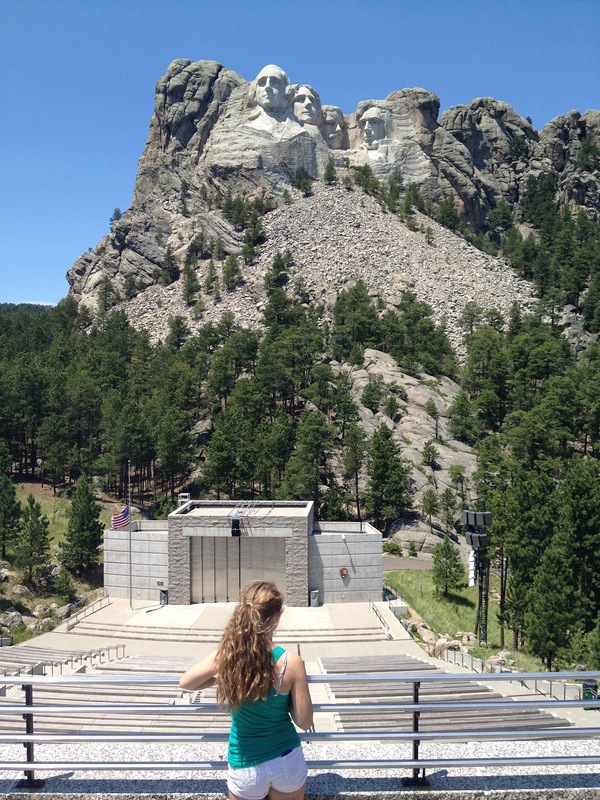 Standing on the lower grand terrace, overlooking the amphitheater and Mt Rushmore. There are nightly lighting programs at the amphitheater during the summer. If you don’t take the trail, this is as close as you can get. If you take the trail, this is how close you can get! The Avenue of Flags is fun for kids. Just ask them to find their home state flag. Ours was super easy since it is the first one on the left side. Then we had to search for my daughter’s, since she was born in a different state. We also took this time to peruse the gift shop. I was able to find a South Dakota spoon for my collection. 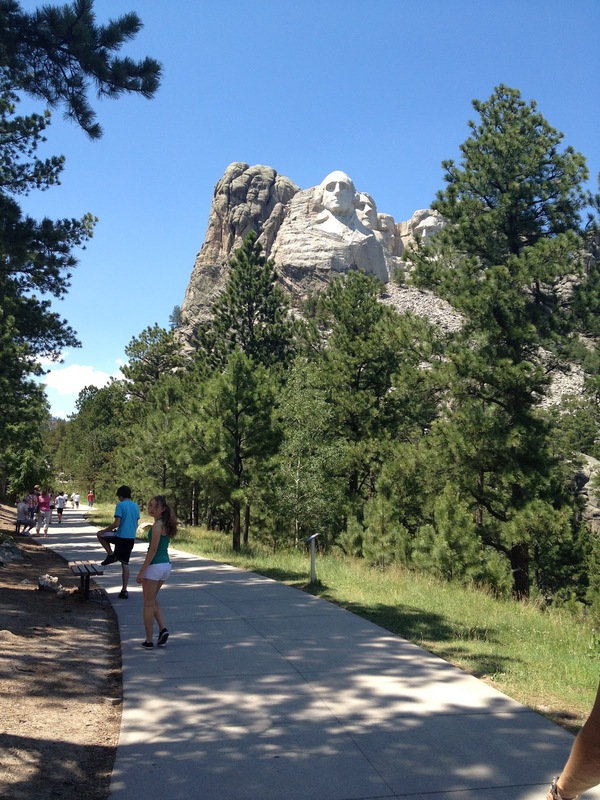 I really wanted to walk the President’s Trail and get a closer look. But because of the heat, I knew we needed to feed ourselves before we went. The restaurant was soooo crowded at that time. Our little trick: grab some food from the outside vendor and eat outside under a shaded picnic table. The food was basically the same, hot dogs and hamburgers made with beef or bison, chips, and drinks. It hit the spot, refueled our bodies and got us on that trail in no time. Heading off on the trail. The first part of it is handicap accessible. 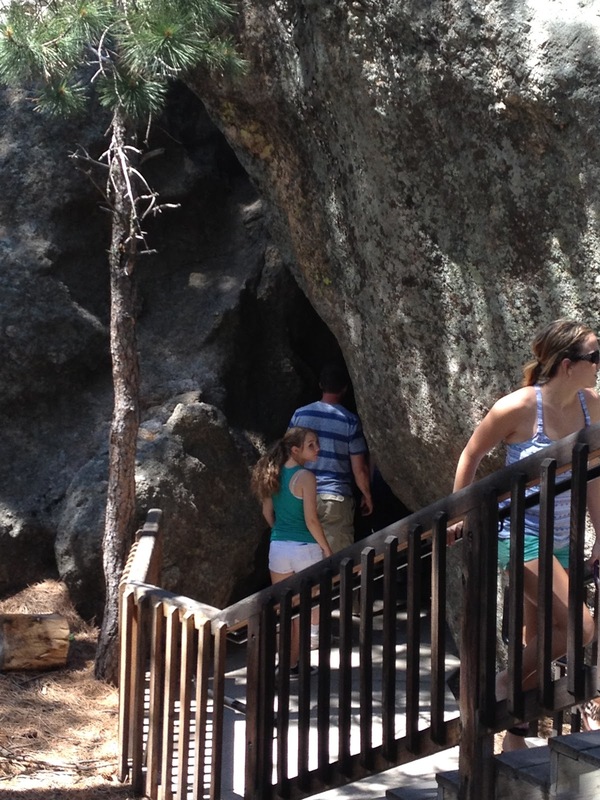 There was this little rock cave off the trail that intrigued my daughter. Inside we discovered an interesting view of Washington and Lincoln. The second half of the trail had LOTS of stairs! If you are active, I would highly recommend it. There were so many good photo opportunities. 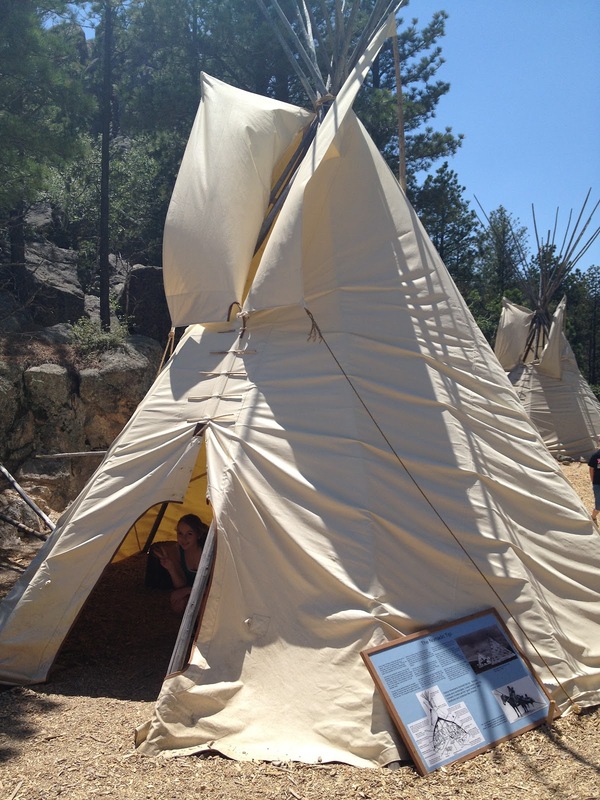 There was a Lakota Indian village set up along the trail. It was being run by a very knowledgeable park ranger. He was fascinating to talk to. 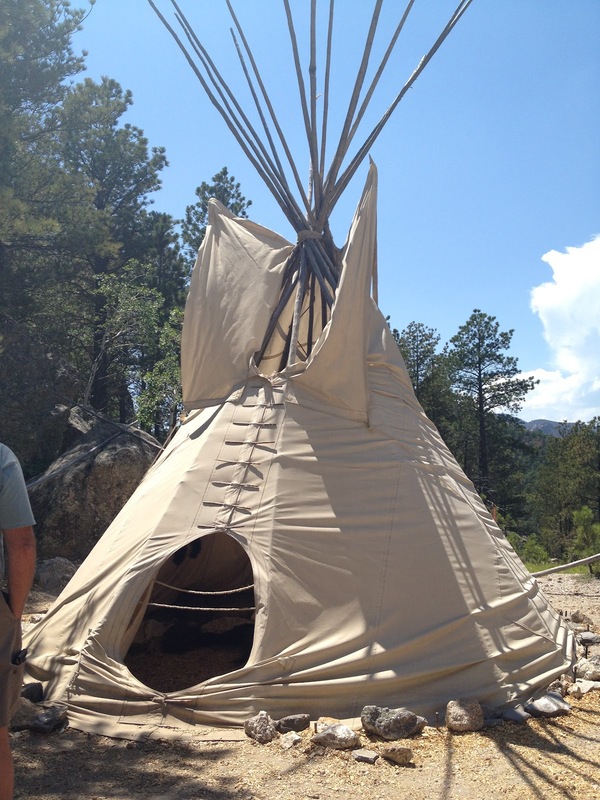 We learned so much about the Lakota Indians. 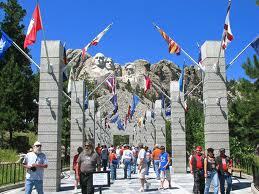 Another way to learn about the Lakotas’ is to stop at Crazy Horse Memorial. Because of our breakdown in the Badlands we had to skip that part of our trip. I do hope I can see it next time.Mt. 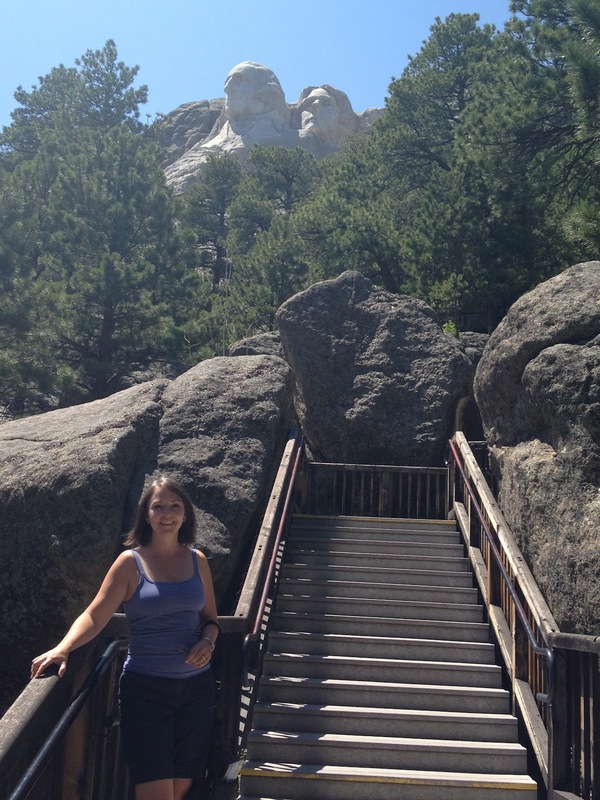 Rushmore was fun to see and I am glad we made it a stop on our wild west road trip. I did overhear a dad tell his son, “Well, now you can say you saw Mt. Rushmore.” I got a chuckle out of that. Without visiting the museum, taking a trip around the trail and grabbing a bite to eat, it really would have felt like we got out of the car, saw Mt. Rushmore and got back in the car. That is why I would take the time to do all the other stuff. Make it more of an experience. 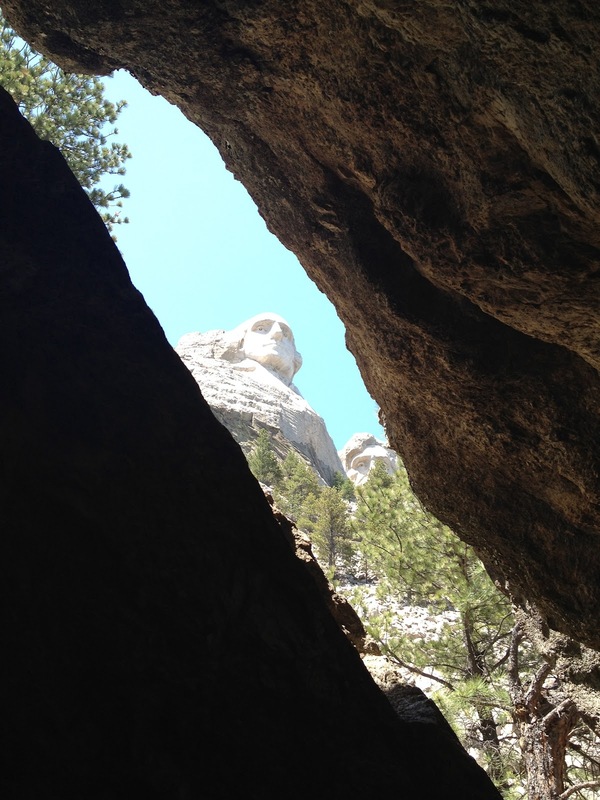 It got me thinking…have you ever visited a place that did not live up to the hype? Where you had planned the day, but only needed an hour? very nice pictures i like this blog i want to open blog about Dubai desert safari from where i can find information? Thanks for sharing that beautiful blue sky. I've always wanted to visit Mt. Rushmore. You had an excellent experience. I'm looking forward to reading your comment on my twin post. Please come back. We have been there also and we LOVED our trip. It's such a dramatic statement and wonderful sculpture. We really enjoyed the badlands. Have never had the privilege of seeing this. It is marvelous and different way to preserve history.